You are here: Home / Content Marketing / 33 Juicy January Marketing Ideas to Jumpstart 2019: FREE Download! 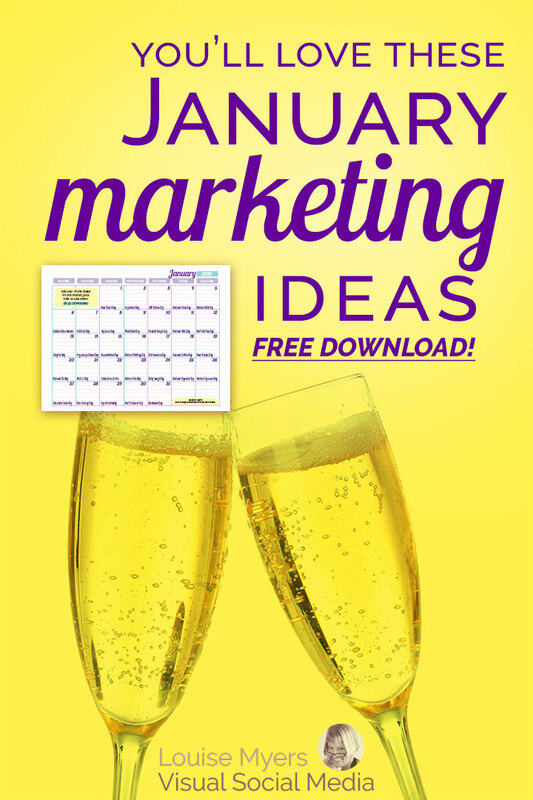 33 Juicy January Marketing Ideas to Jumpstart 2019: FREE Download! Is there a resolution that’s common to your audience? How can you help them make and/or keep it? It’s a great opportunity to promote your business, and how you help make lives better. If resolutions don’t resonate with your business, there are lots more ideas to choose from! I’ve even got them in a super-simple to follow format, which you’ll hear more about further down. Pin or tweet, then read on! Idea 1 is to tap into a resolution of your target market. Per StatisticBrain, these were the top New Year’s resolutions for 2017. I’d guess they usually are! Do any of these month-long holidays resonate with your business and audience? Plan a promotion that could include blog posts, sales, social media posts, contests and more. These holidays last for a week(ish). Dates are correct for 2019 and will be updated each year. The big holiday in January is New Year’s Day (January 1), as it sets the tone for the first few weeks of the year. January 21 is Martin Luther King Jr. Day. Dates below are correct for 2019 and will be updated each year. Dozens more in my Planner. See below! Get a high-resolution printable PDF in the FREE members area! (Link below). Which January Holidays for Your Business? There are truly holidays for every business and personality. Some days have as many as 8 to choose from! As I mentioned in the article on Weird Holidays, there are a lot of places online where you can look up hundreds of fun holidays to connect with your followers. Of course, I can make that easier for you! I’ve consulted several of these sites and cross-checked the info, so you don’t have to. 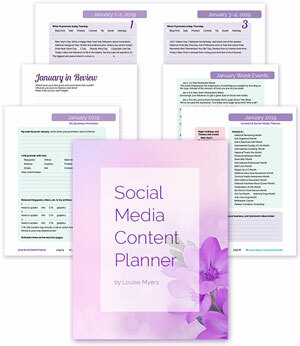 Then I put the most engaging ideas in a handy, printable Social Media Content Planner. Plus, I’ve included ideas on how to use them! And a strategy to ensure that your business promotion gets scheduled first. Then use fun holidays to keep your audience engaged! Purchase this instant download PDF for January only, or for the full year at a 45% savings. 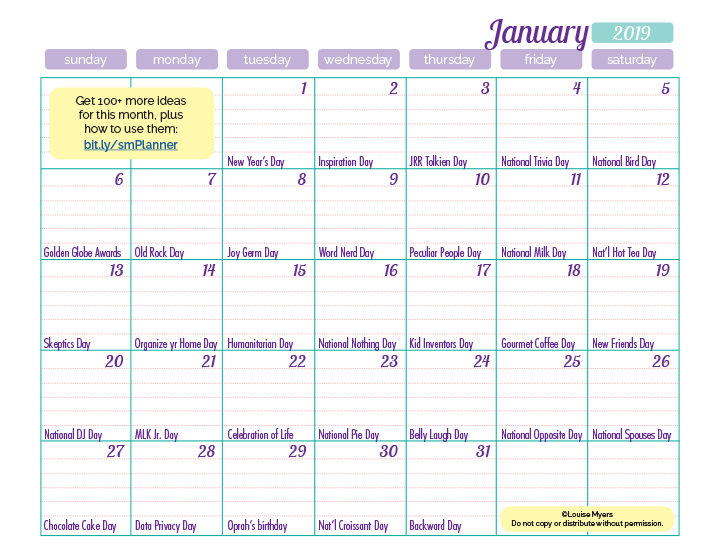 OR, grab the free January one-sheet content inspiration calendar. One prompt per day, plus room to write in your own ideas on how to use it! Get your printable PDF in the FREE members area! To sign up for a free membership, click here. Be sure to pin or tweet this post to share with others. What do you think? 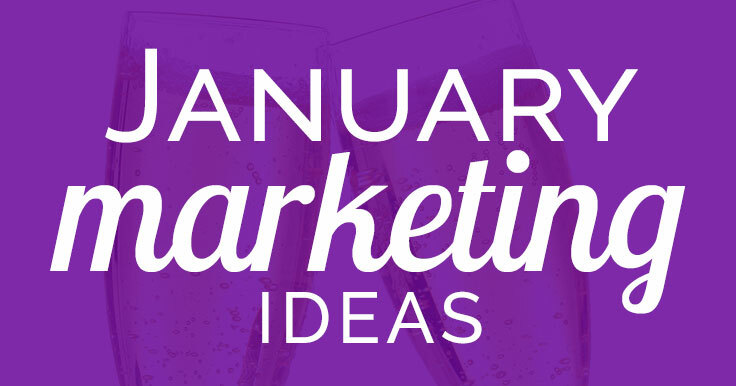 Which January marketing ideas will YOU use? I am like a fish out of the water right now. I have my own website and online shop and am stuck on how to market the jolly thing. Looking forward to receiving your free goodies. 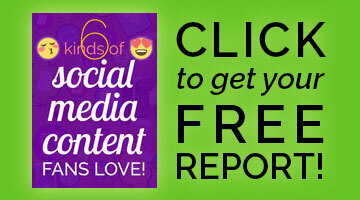 You always provide the BEST and most impactful social media marketing info – thank you!! Off to share with clients and online – cheers!